Evelyn Broderick has been a writer since 2004. Her work has been published by the Jewish Alliance for Women in Science. She holds a Bachelor of Science in chemistry and biology from Macaulay Honors College and is pursuing an M.D./Ph.D. in immunology at Sloan Kettering. She is also a member of the New York Academy of Sciences. A C-section is the delivery of a baby through a surgical opening in the lower belly. It is estimated that in 2011 one-third of births in the United States required a C-section. 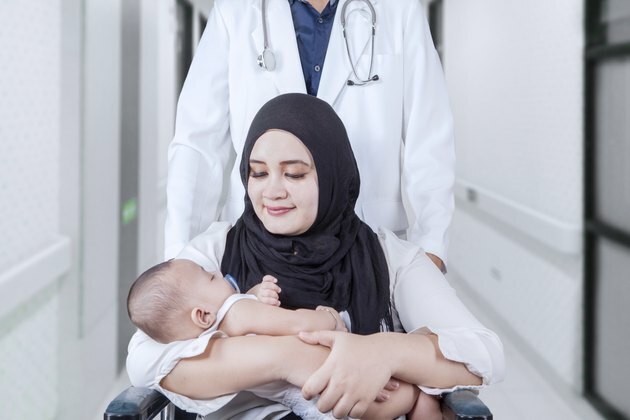 While C-sections have helped many mothers deliver their babies safely in precarious situations such as slowed labor, breech position of the baby and multiple births, there are still risks involved. There are several possible complications, including abdominal problems like infection and bowel discomfort. Infection is one of the major complications of any surgery. After a C-section there is a risk of abdominal infection at the incision site, or in the uterus. Signs of infection include fever higher that 100.4 Fahrenheit, severe pain in the abdomen and redness or swelling at the incision site. Alert your health care provider immediately if you experience any of these symptoms. Many women report gas pains and bloating in the days after their C-section. Constipation is also possible. To avoid these problems, you will be encouraged to walk when you can and to drink plenty of fluids. These issues should resolve themselves within several days; you should seek medical care if they do not. Bladder injury and infection are rare, but possible problems after a C-section. This is because the bladder is located in the abdomen near the uterus. To reduce the risk of urinary tract infection, you should empty your bladder frequently and drink plenty of fluids. There are several things you can do to reduce your risk of abdominal problems after a C-section. The Mayo Clinic website recommends that you walk as soon as you are encouraged to do so by health care providers. This can reduce the risk of bowel discomfort and blood clots. Drinking fluids can help prevent both constipation and bladder infections. Proper wound care is also essential to prevent infection. This includes keeping the area clean and dry and following all instructions given to you by your health care provider.